The two caught the attention of McDonald's — and Ellen Degeneres — after sharing images of a fake poster they hung at one of the fast-food chain’s stores. Ellen jokingly unveils an updated version of their poster on a billboard outside of the Warner Bros. lot and asks them to sneak a piece of her fan art into a McDonald's, and surprises Jevh and Christian by announcing they will be part of an upcoming McDonald's marketing campaign as part of their commitment to diversity and gives them each a check for $25,000 as their compensation, courtesy of the fast-food chain.Michael Rozman / Warner Bros.
What started as a prank at McDonald's became a widespread call for Asian representation in mainstream advertising and entertainment — and even McDonald's has taken notice. Two University of Houston students, Jevh Maravilla and Christian Toledo, went viral on Twitter after sharing images of a fake McDonald’s poster they made and hung at one of the fast-food chain’s locations in Pearland, Texas. The reason for the prank, they said, was because they noticed a lack of diversity on the decorative wall posters. They returned to the Pearland location with a plan: to hang a photo of themselves in the restaurant and see if anyone would notice. According to Maravilla, the plan involved taking a realistic photo to create the poster and finding a McDonald’s uniform at a thrift store. Dressing himself up as an employee, Maravilla, with the help of some friends, was able to covertly hang the poster on a blank wall, which stayed in the restaurant for weeks. “It’s now been 51 days since i hung it up,” Maravilla tweeted on Sept. 2 with photos. He told NBC News that increasing representation was a big reason behind the stunt. Jevh Maravilla and Christian Toledo from Pearland, Texas stop by "The Ellen DeGeneres Show" on Sept. 17, 2018.Michael Rozman / Warner Bros. The video also caught the eye of Ellen Degeneres, who invited the Filipino American students on her show on Monday to talk about their stunt. “We looked around we saw all these other posters on there. We saw that there's different ethnicities, and we saw that they're all these people having fun, so we decided to represent ourselves as Asians, to be up there as well,” Maravilla told Degeneres. Maravilla added that McDonald’s did contact them after he tweeted about it, but instead of being punished, they told Degeneres that McDonald’s corporate executives said the poster would be taken down because of a planned renovation — but that the new store would reflect more of the community’s diversity. McDonald's did not respond to requests for a comment, but did tweet Tuesday night at Maravilla and Toledo: "You guys earned this dream." 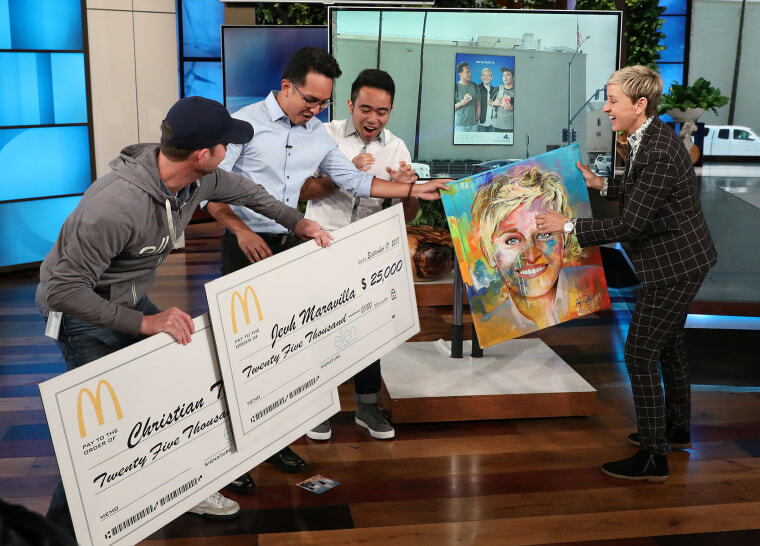 Degeneres surprised Maravilla and Toldeo with the news that McDonald’s would be using the two in a future marketing campaign, along with giving them each checks for $25,000. “The whole world is a melting pot of different cultures, and it’s about time for the media to mirror that,” Maravilla added. “It’s crazy how much of a difference I can make with a small prank and a tweet."